I am a Social Dance Teacher based in Co. Galway. I specialise in the teaching of Social Dancing including Jive, Foxtrot, Quickstep and Waltz. Words can’t express how delighted I am to hit another major milestone of followers to my Facebook Fan Page. I cannot thank you all enough for your kind support and following. As a Dance Teacher you wake up in the morning and you think of ways to do things better and I ask what I can do for myself? But more importantly I ask what can I do for my Dancing Friends and Followers? As the year is coming to a close we can all look back now and assess things that happened and things that didn’t. For me 2016 will be a year I won’t forget for its lows in February when I was diagnosed with cancer and its highs when my operation went well and further tests showed that the cancer was taken away. Since then I feel like a new person inside and I am delighted to be given a second chance to continue my goals in life. I always looked at life in the most positive way I could and I have to thank my Dancing Career for enabling that positive energy to help me get through the hard times that no one is immune to. My DVD “Let’s Jive” has well exceeded my expectations in sales and I want to thank each and every one of you for instilling your belief in my teaching abilities and for making this DVD a huge success for me. I also want to thank everyone who attended my Classes over the years and to the many Couples who came to me for Private Classes for their Weddings. I am entirely grateful for your belief in me. As a token of my gratitude, I feel it’s necessary to give away a gift to one of my Loyal Followers. 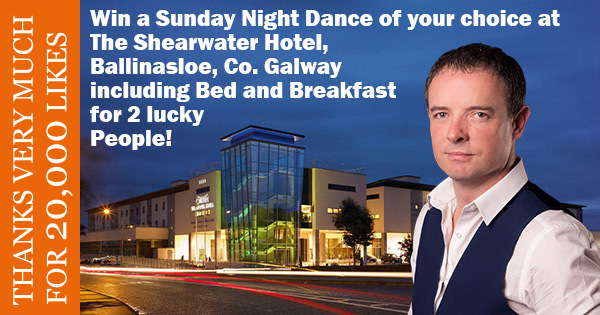 So for this competition I’m giving away a free entry to a Sunday Night Dance of your choice at The Shearwater Hotel, Ballinasloe, Co. Galway, which includes Bed and Breakfast for 2 people! The lucky winner will be announced at 6:00pm on Saturday the 17th of December. Good luck to everybody and remember Folks, if you’re not in, you can’t win!